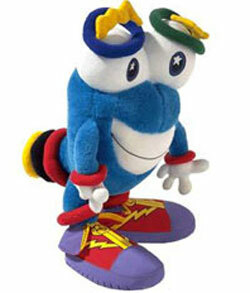 meet the fuwa: fugly olympic mascots. | six words to change the world. ← it kinda paid off for monica. 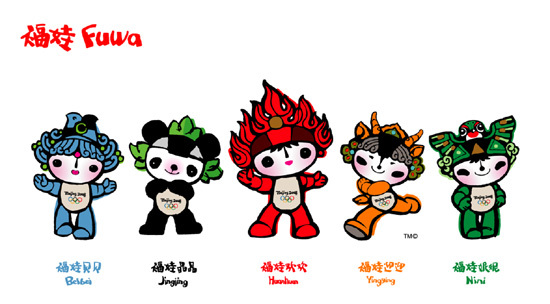 meet the fuwa: fugly olympic mascots. The name Izzy, by the way, comes from “Whatizit?”. Haha. How 90s (read: tacky/lame/awesome/those shoes) is that? According to the artist, who is not feeling so good about his work, these are children–with animal qualities. On which planet, buddy? Because the second one looks legit straight up panda to me. I bet the other children at school make fun of him. And force him to eat bamboo. Oh, and what in god’s name is the yellow one, you ask? A golden lucifer? Beijing Olympic Mr. Tumnus, perhaps? Well, duh, it’s a Tibetan antelope. But wait a second…aren’t Tibet and China in some sort of political conflict? And I thought antelopes were in Africa? Nah, nevermind. So what do you think of these? Will you collect them all? And how pumped are you for the Olympics? By the way, the start date is August 8, 2008. Or, more cleverly and easily marketed, 08.08.08. Nice. Looks like something in a Tokyo airport gift shop. Awful. Pingback: debbie downer rants about the olympics. « six words to change the world. Pingback: newest olympic mascots will haunt dreams. « six words to change the world.